If you’re in the Manchester area, there is a great opportunity to knit for the homeless on Sunday 24th January 2010 between 2-8pm at the Nexus Art Cafe. The event is all about knitting scarves, hats and gloves for the homeless people who give out The Big Issue on the streets of Manchester. It doesn’t matter if you cannot Knit, just come along, show your support and we shall show you how! The Nexus Art Cafe is in the Northern Quarter on Dale Street, just off Oldham Street; it’s a super cozy venue, especially for knitting. Anyone that has made a New Years Resolution to get rid of some of your stash, this is a great way and reason to do so. On a different note, I finally finished the Springtime Bandit shawl/bandit scarf! The reason it’s taken me so long to finish is because after I added a 5th body pattern repeat, I thought I might run out of yarn. Turns out, it was too short and I had plenty of yarn left over, so I ripped it back, but it was too much effort trying to pick up all the stitches, so I frogged it and started over. By this time, Christmas crafts got in the way so I had to put it aside until the new year. 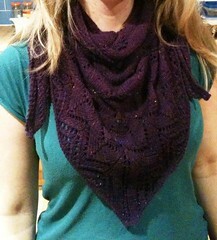 This is a great pattern for a first shawl and/or as an introduction to lace. 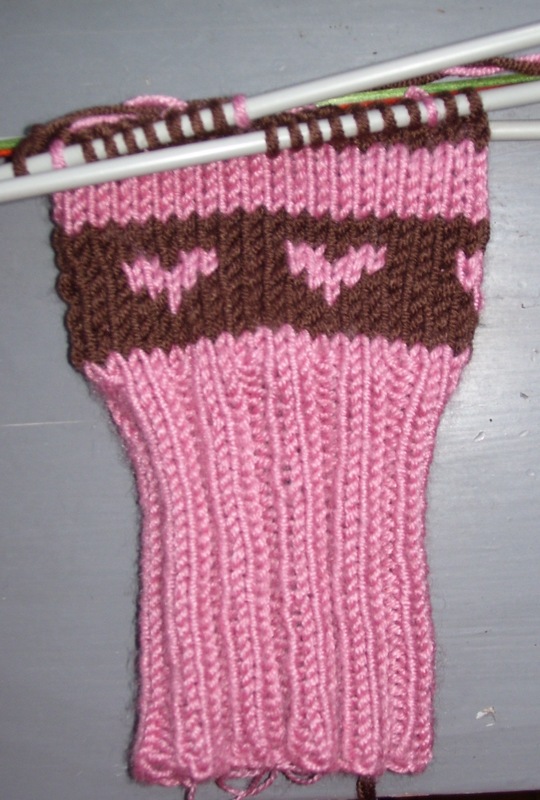 It knits up really quickly and it’s easy to remember the pattern once you get going. I would definitely make one again in the called for worsted weight, but this is only a personal choice mainly because I got really bored with the body pattern after the 5th repeat. The Dream in Color Stardust is so wonderful and perfect for this project, it was totally worth the boredom, frogging and extra time. The sparkles are amazing and catch my eye when I walk past it in my flat or catch a glimpse in a mirror. The pictures really don’t do it justice. After spilling coffee on my Owling Fingerless Gloves at work, I’ve decided to make a work-friendly pair of fingerless gloves, Heart to Heart, out of Twileys of Stamford Freedom Gorgeous and Patons Smoothie DK. The Freedom Gorgeous is 75% Bamboo, 25% Nylon and the Patons Smoothie is 100% Acrylic (very surprising because it’s really not horrible and cheap looking). Despite the coffee spill, my Owlings are fine, but when I washed them, they made my bathroom and hallway smell horrible for the day and a half it took to dry out. So, something more durable is required for everyday wear and tear, plus, they’re cute and I love hearts. 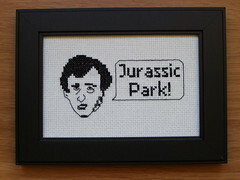 I also made cross stitches, which seem to require a lot of explaining to everyone except the recipients. 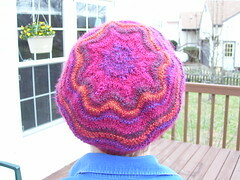 The pattern came from a fellow Buffy Swap participant on Ravelry, so I can’t take credit for the awesomeness of the pattern. 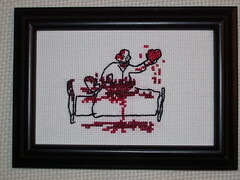 The cross stitch was for my BFF and she put it on a book shelf in her living room at the cost of looking like a psycho to everyone but me. Although, it might prove to be an excellent conversation starter. 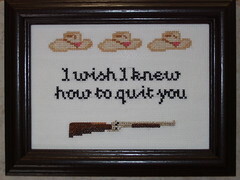 The Brokeback Mountain cross stitch was for my other BFF. There are too many layers of inside jokes to explain and make sense of to someone who doesn’t know us, but I’m really pleased with the result, all inside jokes aside. 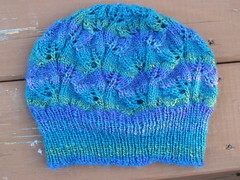 I also had time to make a hat for myself over the Holidays. The husband and I were surprised treated to a trip to Chicago to visit some family, so I whipped up Woolly Wormhead’s Everglade hat in, big surprise, King Cole Mirage! As the weather in Chicago is significantly colder than VA Beach in December, a warm hat was needed. I also made my dad some Illini pajama bottoms, but forgot to take a picture of them; you would probably just be blinded by the bright orange anyway. I don’t ever make New Year’s resolutions, but I’m going to kick off 2010 by only knitting from my stash and completing unfinished projects. This isn’t a year-long resolution, but when the lease on our flat is up in 6 months, it would be nice if I didn’t have so much yarn to move. Wish me luck! *I feel like I should say that I don’t do mother-daughter outfits. I probably wouldn’t make one for myself, except that I know we won’t accidentally wear them out together since we live on different continents.